FIGURE 4-8 Interactions of the first three residues of OT with the strong site of NP. The shaded area represents the protein. The first three residues of VP are the same as those of OT, with the exception of phenylalanine in position 3. Residues 4-9 are not shown. Note that the peptide bond between residues 2 and 3 contributes to the hormonal interaction with NP through hydrogen bonding. 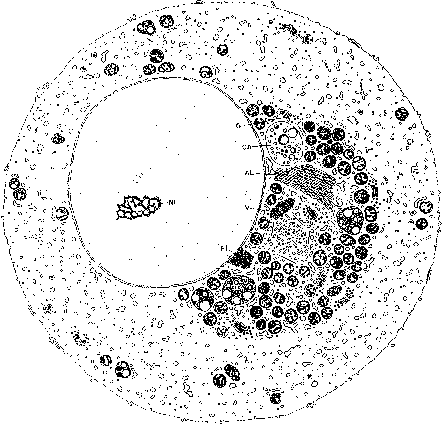 Reproduced with permission from Breslow, E. (1984), "Cell Biology of the Secretory Process" (M. Cantin, ed. ), pp. 276-308. Karger, Basel. FIGURE 4-7 Relationship of biosynthetic precursor structure to molecular events occurring in neurohypophyseal hormone-NP biosynthesis. The filled and open lines denote hormone and NP segments, respectively. The hatched line represents the COOH-terminal glycopeptide occurring in pro-AVP-NP II. Folding of the precursors is visualized to lead to self-association through the NP domains of the precursors. The NP-NP and H-NP interaction surfaces are retained after enzymatic processing, the latter of which leads to the formation of noncovalent complexes between hormone (H) and NP, as well as to dimers in secretory granules until released by exocytosis. Biosynthesis occurs in the cell body followed by folding of the precursor. These are packaged in granules in the Golgi apparatus, and the granules (neurosecretory vesicles) are transported down the axon (the hormone is bound to NP in the vesicles). Finally, the granules are stored in the nerve terminals of the posterior pituitary until the signal for secretion occurs, after which H and NP may rapidly dissociate, producing the hormone free in the blood. Reproduced from Kanmera, T., and Chaiken, I. M. (1985). Molecular properties of the oxytocin/bovine neurophysin biosynthetic precursor. J. Biol. Chem. 260,8474-8482. 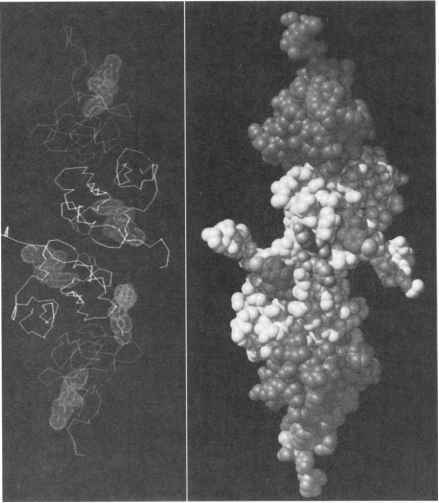 Copyright © 1985 The American Society of Biological Chemists, Inc. FIGURE 4-9 Models of neurophysin II dimer in contact with two molecules of hormone peptide. NPs are indicated in darker atoms (figure on right), while the hormone corresponds to the lighter atoms in the central part of the model. The left-hand side shows a corresponding stick model. The amino acid sequence of bovine NP II is AMSDLELRQCLPCGPGGKGRCF-GPSICCGDELGCFVGTAEALRCQEENYLPSPCQSGQKPCGSGGRCAAAGICCNDESCVTEP-ECREGVGFPRRV. This figure is a black and white adaptation of a color figure reproduced with permission from Chen, L. et al. (1991). Proc. Nat. Acad. Sci. USA 88, 4240-4244. At some point, the VP-NP complex dissociates and free VP in circulation binds to its membrane receptors. An analogous situation can be pictured for neurons synthesizing OT-NP complexes, except that such neurons are more abundant in paraventricular nuclei than in supraoptic nuclei, although they are present in both locations in the hypothalamus. 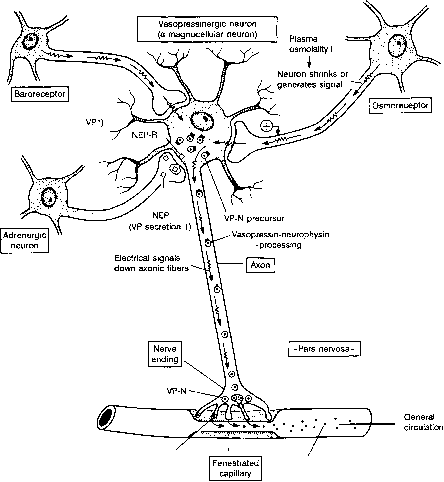 FIGURE 4-10A Vasopressinergic magnocellular neuron and its regulation. Speculative concept of the vasopressinergic neuron and interneurons that provide positive and negative stimuli for the secretion of posterior pituitary hormone. The vasopressinergic neuron in the center has a cell body in the hypothalamus with a long axon extending to the terminal region of the posterior pituitary. The osmoreceptor is the neuron pictured at the right. When plasma osmolality increases, the cell volume of the osmoreceptor neuron shrinks, or ionic changes conformationally alter the receptor to a point where the cell sends an electrical or chemical signal down its axon to the cell body of the vasopressinergic neuron. This signal would generate an action potential or, via a receptor for a chemical signal, a second messenger, whose information would be transmitted down the axon of the vasopressinergic cell to cause the release of the VP-NP complex from the nerve ending by exocytosis. The complex passes through fenestrations in local capillaries and reaches general circulation. Other interneurons that regulate VP secretion are pictured on the left: some aminergic neurons restrict neurotransmitter synthesis to the nerve ending. In the cell body, synthesis of prohormones occurs and the products are packaged into granules. These are moved by fast axonal transport (2 mm/hr) down the axon, and the prohormone is cleaved during this process to the mature products. These are stored in the nerve ending awaiting a signal, as described earlier. After exocytosis, there is retrograde transport of the granule membrane for reuse. tion process could be stimulated by Ca2+, and it could interact with calmodulin for the stimulation of enzymes involved in the exocytosis process. Other regulatory neurons that affect the secretion of posterior pituitary hormones illustrated in Figure 4-10A are those containing norepinephrine (noradrenaline), which are adrenergic neurons, or those containing acetylcholine (cholinergic neurons), which are not shown in Figure 4-10A. These neurons affect the release of posterior pituitary hormones, but it is not clear, as stated before, which modifying neurons are primary for the peptidergic neurons secreting VP or OT and which may be secondary (interneurons modifying the activity of primary interneurons). Indeed, it may be that the osmoreceptor and baroreceptors, instead of producing electrical signals (Figure 4-10A), produce chemical signals of the type shown here. A summary of the neurochemicals that affect the release of OT and VP is presented in Figure 4-12.